DERRY CITY: McEleney set to spearhead Candy Stripes’ challenge! KEY MAN . . .Patrick McEleney. PETER Hutton may moan having lost experienced personnel, but the current form and physique of Patrick McEleney has given the Brandywell boss a major boost. Indeed, so much so, that Hutton sees the 22-year-old as his main threat in terms of scoring goals this season. “He’s returned after the break in superb condition,” declared Hutton last night. “Patrick has knuckled down in training and worked really hard and I think he’s in the best condition he’s ever been,” added the Derry boss. And with Derry’s main scoring threats of Rory Patterson and Michael Duffy having departed the Brandywell, Hutton agreed that “Fats” could well be taking on the role of the leading striker. Normally associated with the No. 10 role, tucked in behind the main marksman, Hutton believes McEleney is more than capable of playing in such a role. “He’s in great nick at the moment and he’s adopted a fantastic attitude and is really anxious to get started this season. “I honestly believe he’s going to be a big player for us this year having matured so much which is great for the club,” continued Hutton. Quizzed on McEleney leading the front-line, Hutton agreed that the player had much to learn in such a role. “However, during his youth career he’s always led the front line, but he will be the first to note that it can be hard work and, at times, a very lonely position to operate in. “But I believe he can grow into such a role and, at the same time, hurt teams with his undoubted technical ability. 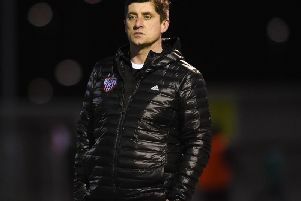 Commenting on the Wednesday night’s game, the Derry boss was glad to get “more minutes” into his players and happy to see Ryan Curran add to his goal against Ballinamallard with new hitman, Cillian Morrison, also finding the target on his home debut.